If you have any other questions regarding the care of your plants, feel free to fill out the contact form under the Contact page or email us at info@gemstatecarnivores.com. Having trouble with your plant? Visit the What’s wrong with my plant? page. General practices for all carnivorous plants. All carnivorous plants need consistently damp soil. An easy way to keep your plant watered is to fully fill its tray and allow the water to naturally be taken up by the plant. When the tray is empty, wait one or two days, and then refill the tray. For very tall trays, fill to one or two inches. All carnivorous plants, particularly Venus fly traps (Dionaea), Sundews (Drosera), and North American Pitcher Plants (Sarracenia) prefer distilled or RO (reverse osmosis) purified water. However, Butterworts (Pinguicula) seem to grow happy with the higher mineral content of tap water. North american pitcher plants (Sarracenia) can be grown with the pot mostly submerged in water (on a pond edge for instance or in a small water feature). Do not fertilize your carnivorous plants. This is left to the adventurous and experienced plant growers. A small insect may be fed to your plants from time to time. If you don’t feed your plants any insects, a small amount of crushed beta pellets or fish flakes may be applied to the leaves and pitchers. Tweezers or narrow point forceps work great for applying the fish food to leaves and traps. Feeding isn’t always necessary but may aid in the growth, especially with tropical pitcher plants, butterworts, and sundews. North American pitcher plants (Sarracenia) grown outside will gorge themselves on insects and will never require feeding! In general, carnivorous plants love bright light and a lot of it. For indoor grown plants, place them in your sunniest window or close (6″ – 12″) to fluorescent lights. For outdoor plants, full to partial sun is recommended for north american pitcher plants (Sarracenia) and certain species of sundew, including Drosera multifida, Drosera binata “T form”, and Drosera “Marston Dragon.” Other outdoor sundews prefer bright shade to partial sun, these include D. dichotoma “giant”, D. filiformis, and D. tokaiensis. Venus fly traps can be grown in full sun but seem to grow best in bright shade to partial sun (several hours of direct sunlight a day). Feel free to experiment with lighting, if your plant doesn’t look happy after a few weeks, move it to a brighter location. Most carnivorous plant will lose their coloration and turn green when provided with less than adequate lighting. Sundews will often lose their “dew” and may become somewhat lanky. 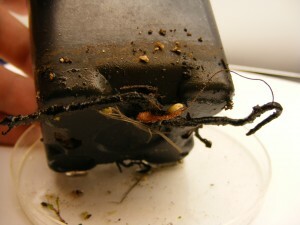 Venus flytraps tend to become dark green, produce small traps, and the petioles (the part below the trap) become wide and flattened against the soil. Tropical pitcher plants often will reduce pitcher production under inadequate lightening. If your plant is in a terrarium and on a window sill, avoid long exposures to full sunlight. Prolonged sun exposure may heat the terrarium to dangerous temperatures. All carnivorous plants can be grown in a 50:50 sphagnum peat to perlite ratio. Make sure to keep it moist! Interestingly, carnivorous plant traps and pitchers are actually modified leaves! In comparison to the leaves, most carnivorous plant flowers are fairly uninteresting with the exception of the butterworts and north american pitcher plants. The best policy is to watch your carnivorous plant bloom for a few flowers and then remove any flower stalks as they form by cutting them near the base of the stalk. This saves the plant energy and allows the plant to further produce robust leaves and traps. An emerging venus fly trap flower. Once you see white flowers, remove the flower stalk. However, butterwort flowers are gorgeous and should be left to enjoy. If you really like flowers all the time, a mature sized specimen of Pinguicula potosiensis is a real joy. Only North American pitcher plants and venus flytraps need to have a winter dormancy period. Some temperate sundews also require dormancy, such as D. filiformis which forms winter resting buds called hibernacula. If you are in a USDA hardiness Zone 7 or above, you can safely overwinter temperate plants outside unprotected. However, due to the harsh nature of Idaho winters (Zone 6a), your pitcher plants, temperate sundews, and fly traps need some protection. In Idaho, plants need to be moved to a protected place around mid November. At this point, virtually all of your pitchers will be browned (the possible exception being S. leucophylla and its hybrids) and the plants will be going dormant. Temperate sundews will typically lose all their leaves at around the first frost and will have formed hibernacula (winter resting buds) or have gone dormant. Plants should be placed into a protected but cool place, such as a shed, garage, outdoor greenhouse, or even something as simple as a very well insulated box. If at all possible, keep dormant plants where they will still receive sunlight. Another very effective method, particularly for a large collection of temperate carnivorous plants, is to place them under a row cover. A row cover is comprised of a plastic film that is attached to a frame and placed over the plants. This method allows your plants to remain outside and can be made inexpensively out of PVC pipe and plastic film from a hardware store. The plants simply need to be protected from the harshest conditions and prolonged freezing. Before protecting your plants, remove any dead plant material. Leave any green pitchers, phyllodia (they appear as flat, uninflated pitchers on north american pitcher plants), or traps. Freezing of the plant soil is fine as long as the plants are protected. Keep the soil damp but not waterlogged. Watch regularly to ensure damp soils and no fungal growth. Apply fungicide if fungus is present. 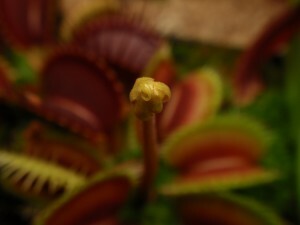 It is normal for some plant growth to occur over the winter, particularly from the venus flytraps. Resume normal care as soon as conditions are favorable in the spring (no harsh frosts or very cold periods). In Idaho, this is usually mid to late May. What plants can I grow outside? North american pitcher plants (Sarracenia) should be grown exclusively outside in very bright light. Some sundew species such as D. filiformis, D. ‘Marston Dragon’ like shade but D. dichotoma ‘giant’ can be grown outside with your north american pitcher plants. Venus flytraps can also grow outside in full sunlight. Be careful not to let the water dry out for any extended period. Keep in mind that most plants that can be grown outside require a winter dormancy. When do I repot my plant? A good time to repot your plant is when roots are visible from the drainage holes. Sarracenia will need repotting when the rhizome (the root like structure where all the pitchers originate from) fully fills the pot or is noticeably deforming the pot (in this case, it will look like it is about to break the pot). Butterworts have short and delicate roots that only usually extend a few inches into the soil. They may never require repotting. When selecting a new pot, find one that is larger in width and depth by at least 1 inch but in general, the more room the better.